Excavations continued this week at Fort Hunter and despite intermittent showers the crew was able to put in a full week at the site. Our process of covering the entire excavation block ( about 20’ x 60’) with 8-mil black plastic would make an engineer scratch his head- but there is a method to the madness. We manage to cover the units every night and uncover them the next morning, pretty unscathed. When it rains, the challenge is to remove the water off of the surface of the plastic without letting it run onto the units below. We have added a new tool to our supply kit for the dig- Pig Pillows -super absorbent pillows that we use to soak up the water that does manage to get through the plastic. An unconventional tool, but one that has helped us keep the project moving. This week, the final sections of Feature 47 were mapped and excavated. This is a large, approximately 8 feet in diameter, fire-cracked rock (fcr) feature to the north of the well (see previous blogs). This sounds so simple, but the process of mapping and recording each of the pieces of fcr requires both time and patience. Each of these pieces is bagged separately, so each bag requires all of the provenience information to insure proper cataloging. Our volunteers that help process the collections in the lab are always amazed at the process of recovering artifacts in the field and recording those artifacts to insure that provenience information is retained for each piece recovered. Getting back to the site, removing this feature allowed for the removal of soils in these two units which are dating now to the Late Archaic period. Fewer artifacts are present at this level, but we continue to recover chipping debris from lithic tool production or resharpening of tools. Our fcr feature (#47) removed with the floor cleaned and level on the north end of the excavation block. On the south side of the well, our efforts have focused on removing soils from the levels surrounding the well. Our visit last week with Dr. Frank Vento confirmed our theories on the soil changes we are experiencing in these units. These sandy soils contain evidence of flooding episodes occurring along the Susquehanna River over thousands of years. Random pockets of water washed cobbles were deposited there as the channels of the river shifted and changed over time. Removal of one of these large cobbles yielded a charcoal deposit which we anticipate testing using AMS (accelerator mass spectrometry) dating. We expect a date between 10,000 and 12,000 years old. All of our efforts in the prehistoric levels are leading up to the dismantling of the well. The well shaft has been cleared of about another three feet of debris, which continues to contain 19th century ceramics, glass and oyster shell. Our volunteers Seth and Jerry have done a great job with this feature. Our goal is to remove several more feet of debris and then auger again to see if the coal ash, oyster shells and 19th century artifacts continue in the lower levels. Jerry has removed another foot of fill from the well shaft- how low will he go? The number of visitors to the site has been fantastic and we have had a lot of assistance from our many faithful volunteers. The staff of Fort Hunter Mansion and Park are great to work with and the ladies have been bringing lots of visitors to the mansion out to our excavations. We are just over the half-way mark for the excavation so if you haven’t stopped by to see us, now is the time. Our fall programming at The State Museum included the annual Home School day on Wednesday, September 26th . This program is organized by our Education Department and their staff pulled together a great series of activities for the students and parents. Presentations in our gallery included a Lenape Indian story presented by Bobbie Glass and an introduction to the excavations at Fort Hunter in our alcove exhibit. Preparations are well under way for Archaeology Month activities including Indian Day at Fort Hunter on October 7th and Society for Pennsylvania Archaeology at Cabela’s on October 21st. These events are followed by the Workshops in Archaeology, see link on right column, offered at The State Museum on November 3rd. Next week is October and the beginning of Archaeology Month in Pennsylvania. This is an opportunity to visit archaeological sites and exhibits across the Commonwealth and learn about your communities’ archaeological heritage. The local chapters of the Society for Pennsylvania Archaeology are conducting special programs during the month and they would love to see you at their events. Remember to record your archaeological sites with the Bureau for Historic Preservation and remember it is up to you to help us to Preserve our Past for the Future. By all accounts, Fort Hunter Day this past Sunday was a resounding success. Over 5000 visitors were in attendance enjoying arts and crafts, and of course delicious offerings of food throughout the park. The excavation block too was a flurry of activity with the full complement of the State Museum of PA, Section of Archaeology staff on hand and a dozen eager volunteers excited about exploring history hands-on. For the most part the day was an even mix of continuing to remove prehistoric levels surrounding the well feature and pausing to answer the questions of a near constant stream of inquisitive folks of all ages about what we were finding and how we go about finding it. The well feature itself was also cleaned up and some progress made. On Sunday, intermixed with coal ash, cinders and slag, a large section of a glass hurricane lamp was recovered. Given the context of its discovery it is comfortably 19th century in origin. Oyster shells and dietary bone fragments also continued to be unearthed from the well. The extent of the excavation in this feature now stands at over 10 feet below our datum or about 8 feet from the ground surface. One personal highlight of the day was the rare combination of a mid-morning serenade from a set of bagpipes while troweling through stratum 3, level 1 of the N85 W5 unit. Now, many people have heard bagpipes, and an ever growing number of people have participated in archaeological excavations, but both at the same time? I would wager the number of people that have had the pleasure of that unique experience is relatively small. Other oddities witnessed at the site include this Navy airship. The MZ-3A, the only one of its kind, was spotted floating overhead on a crystal blue afternoon. The fruits of our labors continued to pay off on Monday, as a Koens-Crispin projectile point fashioned from metarhyolite was recovered from the FCR feature (north of the well) that had also been producing chert, quartz and jasper debitage as well as the occasional very small fragment of prehistoric pottery. The Koens-Crispin projectile point type has been dated elsewhere to the Transitional Archaic Period, or roughly in the neighborhood of 4000 years ago. This particular specimen’s slightly asymmetrical shape suggests it may have been hafted to a short handle and functioned more like a knife as opposed to the business end of a long spear. As the saying goes, ‘all good things must come to an end’ and unfortunately such was the case with the fantastic stretch of weather we had for the first week and a half of the 2012 excavation season at Fort Hunter. Like most activities taking place outside this past Tuesday, our field work was a complete wash. However, undaunted by the precipitation, the crew rebounded Wednesday and Thursday removing several more discrete levels of stratum 3 down to level 10 in the units south of the well feature. Level 10 is likely early Holocene (8000 to 9000 years old) in age and we are anxious for geomorphologist, Dr. Frank Vento, Clarion University of Pennsylvania to visit the site this Friday. Pebbles and cobbles are increasing in frequency in the lower levels of these units. The high energy floods that may have deposited this material may have also eroded any cultural materials and we are interested in Dr. Vento’s assessment of these layers. Finally, four new units have extended the block to the north where it now meets the steep bank that drops off some 35 feet below to the trickling waters of Fishing Creek. If there was a stockade along the north edge of the fort (which we feel is unlikely considering the steep cliff), it should be evident in these units. Stay tuned for more updates as next week we mark the half-way point in the 2012 excavation season at Fort Hunter Mansion and Park! Archaeologist are generally outdoor lovers and can take most any weather in stride-rain, heat, snow- we pretty much persevere and keep on digging. The weather this week was stellar and the gardens surrounding our units at Fort Hunter provided a picturesque venue for excavations- pretty darn close to ideal conditions. The focus this week has been cleaning the floors and walls and digging the units around the well so that it can be safely excavated. We are hoping to have someone excavating in the well during Fort Hunter Day on Sunday, September 16th. Excavating in the units along the south wall of our large excavation block yielded small flakes in a variety of materials including black chert, green chert, quartz, quartzite, and metarhyolite. A diabase biface and a chert Brewerton Eared-notched projectile point were also recovered. The projectile point dates to the Late Archaic period or about 4,000 to 5,000 years ago. Stratigraphically, this coorelates well with the levels above which dated to the Transitional period. The size and the shape of the flakes indicate that they were the result of the re-sharpening of tools. Although, re-sharpening and general tool maintenance were common activities, two chert pebble cores were also recovered from the Late Archaic occupation indicating that initial tool production was also taking place. It is easy to imagine native peoples traveling along the Susquehanna River Valley and stopping on this high bluff overlooking the river to camp for a few days to hunt or fish. ﻿﻿﻿ Excavations on the north end of the block resumed with removal of the remaining A horizon soil in a single excavation unit. This unit contained a fire-cracked rock (FCR) hearth feature which was partially excavated in adjacent units last year. An additional twenty-five pieces of FCR were recovered along with lithic flakes produced from retouching/re-sharpening stone tools. This area of the excavation block has produced a very early form of prehistoric pottery in the Susquehanna Valley identified as Vinette I. None of the recovered sherds are very large, but their distinct interior and exterior cord impressed markings, quartz temper, along with a rather thick, crumbly body are readily identified. The recovery of broadspears and narrow stemmed points, and this early pottery indicate a Transitional & Early Woodland floor which dates to approximately 3000-2000 years ago. 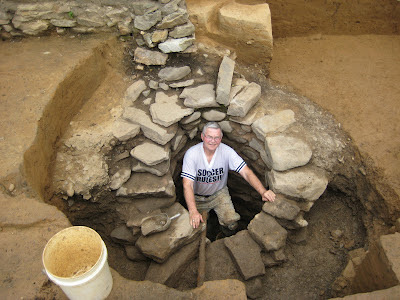 We scraped and cleaned the walls surrounding the well feature, but have not proceeded with any further excavations. We hope to start removing some of the fill from the shaft that washed in over the winter late this week or early next week. Removing the well will require stepping back into the surrounding units and those soils must first be removed in order to insure a safe excavation. The "Grand" staircase into our excavation block. The depth of our excavation block has presented challenges for carrying equipment and buckets in and out of our units. To the rescue was our own handyman Jim Herbstritt, who created a deck and stairs from wooden pallets. A fine display of low budget craftsmanship, but this moveable staircase has been a welcomed addition for navigating the excavation block. Our visitors to the site have included children and adults, this week we were honored to be a featured stop on the French & Indian War tour sponsored by the Archaeological Conservancy which was followed by a visit to The State Museum to view our gallery and collection on exhibit from the excavations at Fort Hunter. Several school groups have visited the site along with random visitors just stopping in to see what we are doing and watch over the excavations. Our faithful volunteers have been helping once again, and a few new folks have joined in our excavation. If you are interested in seeing the excavations, we will be at Fort Hunter from 10:00 a.m. to 5:00 p.m. this Sunday. We are also on site all next week from 9:00 a.m. to 4:30 p.m.- hope to see you soon! Labor Day weekend is traditionally considered the end of summer since it is time to go back to school, days are getting shorter and stores are full of Halloween decorations. It also marks the beginning of a season full of public programming for the Section of Archaeology at The State Museum. Our kick-off event is Harrisburg City’s Kipona Festival on City Island. This event features the dug-out canoe and artifacts from the excavations conducted on the island. We are invited to attend by the Native American Pow-Wow organizers who provide a space large enough to handle our twenty foot canoe and exhibit. The dugout canoe is always popular with young and old, including their pets. Here are a few of the shots taken over the course of the three day event. The soggy pictures on Monday have become a tradition, although the rains were not as heavy this year. The dugout came back to the museum for a short rest before it travels to Cabela’s in Hamburg, Pennsylvania on October 21st. If you missed the opportunity to see it at Kipona, here is your next opportunity to sit for a Kodak moment. We dried out our equipment and began the process of loading up for our excavations at Fort Hunter Mansion & Park. Our first day at the site (36Da159) was Wednesday, September 4th. The excavation block from last year was not back filled as in previous years; instead it was strategically covered in black plastic with shoring and braces to support the walls. We weren’t sure what to expect when we removed the plastic, but were pleasantly surprised at how well this system had worked. Thanks to the staff at Fort Hunter for their assistance in installing this system. We are diligently working at preparing the site for excavations this year. We have surveyed and set the grid. Installed a new line of posts to allow for additional units at the north end of our excavation block, and checked our datum points to insure that our measurements are accurate and consistent with previous excavation records. All of this prep work is necessary and has to be done before we can remove that first bucket of dirt. Our clean-up process involves scraping and straightening the walls of our units and stabilizing any areas that have slumped or washed out. The first part of the exercise was removing large stone slabs of a sidewalk that were threatening to collapse into the unit. With strong arms and backs the slabs were moved and the west side of the unit secured. Yesterday was a productive day with an added bonus of two projectile points. One from the south wall and one from the east wall of our block. The well survived the winter fairly well and we are cleaning up areas that were undercut by rain both last fall and this summer. Excavation of the well shaft can’t proceed until this process is finished and the surrounding walls and floor scraped. All of this is leading up to our first public event at Fort Hunter next Sunday, September 16th, Fort Hunter Days. We hope you can come out and enjoy the festivities at the park and view our excavations. We will be on site, weather permitting, Monday –Friday (9-4:30) through October 12th and the public is invited to stop by and ask questions. We are taking a break from the archaeology by county tour until after our public programs are complete- sorry Fulton County! We should be back on our tour sometime in November, until then we hope you will follow us on our blog and come out to some of the events we will be providing this fall.